A multi-million Euro project has advanced global progress on capturing tidal and wave energy thus bringing the EU closer to its target of generating 20% of its energy consumption from renewable sources by 2020. Co-ordinated by University College Cork, Ireland, the EUR 11 million initiative with the help of EUR 9 million in EU funding - MARINET - provides marine energy development companies, entrepreneurs, start-ups and researchers with free, fully funded access to marine energy experts and the world's leading wave, tidal and offshore-wind test facilities. 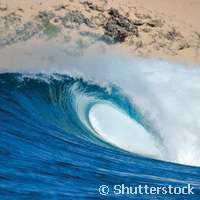 Estimates suggest that 0.1 percent of ocean generated energy could be capable of supplying the entire world's energy requirements five times over. But currently it only provides a minimal amount. To develop this vast potential MARINET focused on sharing resources and global knowledge. The team have already prevented expensive mistakes and unnecessary duplication by independent researchers operating throughout the EU, saving researchers millions of Euros. The project's EUR 11 million budget is being used to directly fund access to international marine testing and research facilities, including travel costs and to promote networking, testing standardisation and research. The cost of access to world-class test facilities can range from EUR 1 000 to over EUR 30 000 per week depending on the scale and complexity of the facility. 'By offering European-wide access to marine energy test facilities, the best facilities and expertise in the world are being shared, which saves several thousands and often hundreds of thousands of euro in the costs of development, it promotes standardisation and also ensures that marine renewable prototypes are tested in all sorts of marine conditions', he added. The MARINET initiative has already supported over 350 marine energy developers and granted 412 weeks of testing at facilities located throughout Europe. More than 100 devices have been tested for their suitability for marine energy generation at over 30 test facilities in Europe. MARINET project partners and beneficiaries will disseminate their developments in a seminar due to take place in Rome from 5th to 6th November 2013. Set for completion in March 2015, a final call for MARINET applications will be issued shortly.